Formula 1: My first taste of 'open wheeler' racing commenced with a visit to Sydney's Warwick Farm where I was privileged to watch Jim Clark and Graham Hill pilot their beautiful Team Lotus cars around the circuit. Subsequently I followed Formula 1 for many years through the media, reliant on Murray Walker's 'fantastic' (Murray's favourite word), coverage of all things F1 and I really cranked the interest whenever and wherever Ayrton Senna did 'anything', including model aircraft flying! Meeting Murray Walker at Goodwood in 2009 and observing that the Mercedes Factory were re-entering Formula 1 in 2010 rekindled my interest and I hope to attend the Australian Grand Prix at Albert Park from 2010 onward. 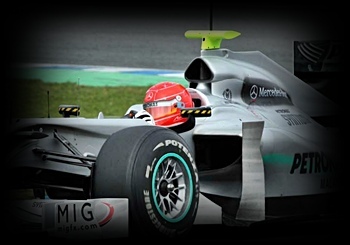 The 'clickable' image depicts Michael Schumacher testing the new Mercedes/Petronas F1 Car in February 2010!